Today, when every entrepreneur is looking Gurgaon as the best source of growth in its business, choosing a perfect commercial project for the starting of your business career becomes more important. There is hard-core competition everywhere in this booming city and everyone wants to establish himself here and earn higher profits. In this series, Elan Miracle Gurgaon is bringing a tremendous range of commercial spaces for those who have the desire to make the most from Gurgaon city. These high-end commercial spaces have top-notch specifications and are built with superb interiors. With some tremendous range of multipurpose retail spaces, you can choose the best fit for you that suits perfectly for your business. Buyers can found here a professional work environment which laid out to harbor exceptional growth and will nurture your business skills. These office spaces in Elan Miracle Sector 84 are the most suited solution for several types of buyers including freelancers, entrepreneurs, start-ups, remote employees and individual consultants. A thimarvelousus project is offering retail shops, food courts, multiplexes and serviced apartments. The property has been spread over 7 acres of land and it is a corner plot with three sides open, all attached with wide and smooth roads. Out of the total space, 2.5 acres of space has been left open for landscape regions. A convenient location of Dwarka Expressway makes Elan Miracle Gurgaon Sector 84 more advantageous for the business growth. 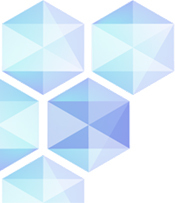 As the project provides seamless connectivity throughout the entire NCR, it is convenient for your customers, colleagues and guests. Several top residential projects are closely attached to this property. Some of them can be enumerated as VatikaBestech, DLF, Ansal, Emaar MGF, Gurgaon One and Spaze. Transportation system around it is very active, smooth and available at regular intervals. Apart from the multi-utility corridor of 135 metres on its one side, it has proximity to the Dwarka Metro Station. 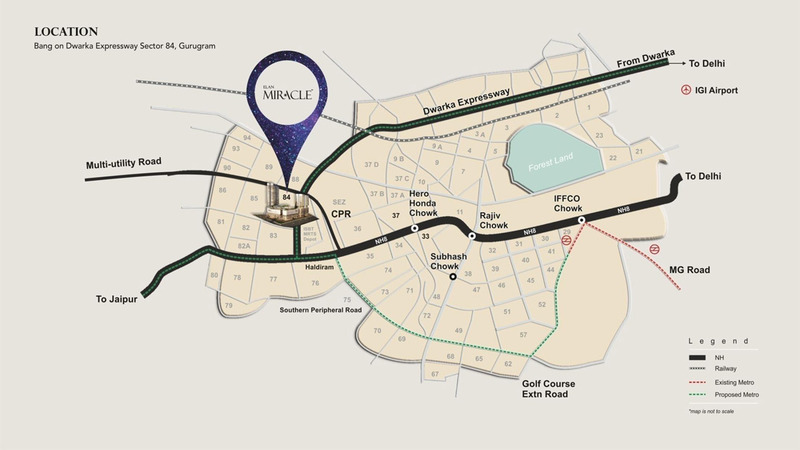 The wonderful Elan Miracle Location Map also provides a hassle-free commuting from South Delhi, Manesar, Connaught Place, Karol Bagh, Manesar etc. All these are highly reputed regions in NCR and are the working destinations of several people. So, overall, the property provides an excellent future to your business as when millions of people will pass throughout in front of your space, some of them will definitely come to you for their requirements and queries. The grandiose property provides several recreational activities for leisure and fun. Customers visit here can enjoy the gold class screen in PVR to enjoy their favourite movies. This is the largest multiplex nearby with 18 screens. The famous KWALS group has already shown here the interest and has booked here a space for providing supreme food facilities to your customers. Fashion lovers are coming here in large numbers as the JLL Group (Asia’s leading leasing company) have marked their presence here with the presentation of the topmost premium brands. The entire property is a fully-secured complex and world-class security features are available here in the form of round-the-clock security with professional guards and CCTV monitoring is available to view every corner of the complete development. There is a grand clubhouse here where different types of recreational activities are available to enjoy your leisure time. Power backup is available 24X7 in case of an emergency power cut and dedicated lift systems and hi-speed elevators ensure the convenience of your customers here. There is ample space here for the car parking and you can choose both from the open and covered car parking spaces to park your vehicle. 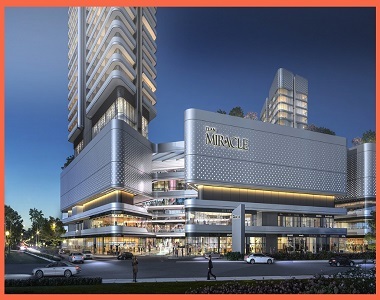 Outstanding is the only word you can set for this brilliant construction where the assurance of business growth comes with the possession of your retail space for which the Elan Miracle Price List set is very genuine and comparative. Several offers like easy payment plans and loan facilities are available here to make your purchase process easy and convenient. 11% Fixed Return With Bank Guarantee. Space for restaurants, a large food court with world cuisine and a fun zone.